Incredible Slow Cooker Ribs | Mexican Appetizers and More! These Incredible Slow Cooker Ribs (or Instant Pot) are just that, incredible! 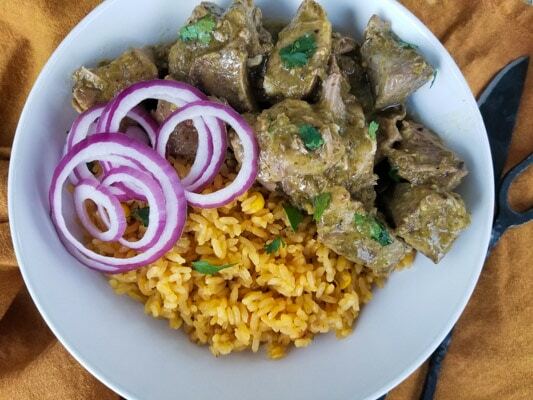 Serve with white or yellow rice and have the perfect meal and comfort food. Or tuck ribs in corn tortillas, tostadas or burrito wraps and have the perfect appetizer, lunch or meal. These slow cooker ribs promise to not disappoint! These Incredible Slow Cooker Ribs are just that, incredible! 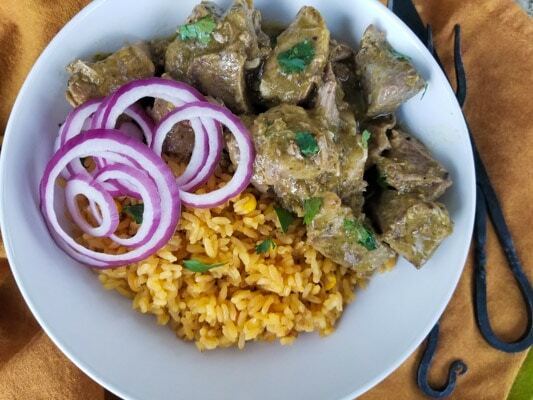 These boneless ribs are easily thrown into a slow cooker with just a few ingredients and one cup of my favorite salsa verde. In the end, you will have ribs that are super tender and hyper tasty. Serve these ribs with rice and have the ultimate comfort dish. 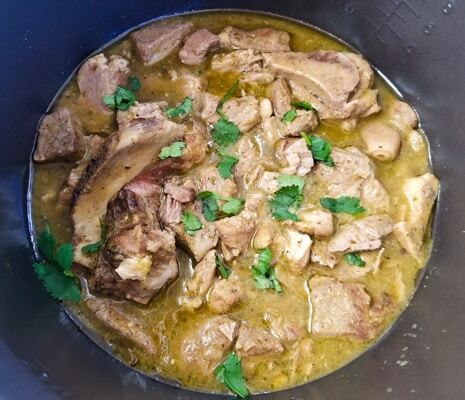 Or maybe you prefer to tuck these slow cooker ribs in between a tortilla and have scrumptious pork chile verde tacos. Or maybe you prefer slow cooker rib tacos/tostadas. Whichever and however you choose to devour these slow cooker ribs, you surely will not be disappointed. The key ingredient for these ribs is of course one of my favorites; salsa verde! Although the salsa requires a few minutes of prep work, you will not be disappointed. Why? 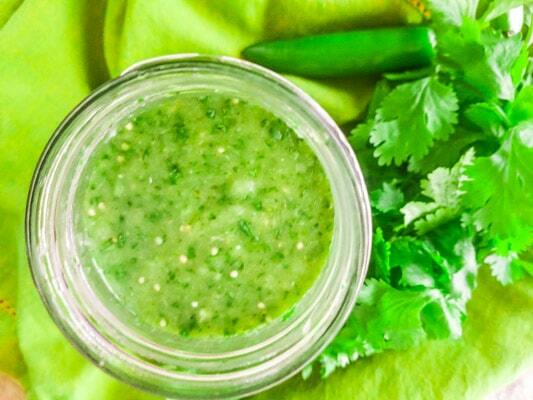 Because nothing compares to homemade salsa verde! It only takes about 20 minutes to make the salsa. Then add the ribs, salsa verde, condiments and a few other ingredients into the slow cooker and you will be ready to go! So in under thirty minutes you will have a fabulous dish working its magic! Then cut up the ribs into two-inch cubes. Season meat with salt and pepper and sear pork in a skillet (optional, not necessary) for a few minutes until meat is golden brown. And in the end you will have delicious slow cooker ribs that are perfectly tender and hyper flavorful. Serve these slow cooker ribs with white rice or yellow rice. 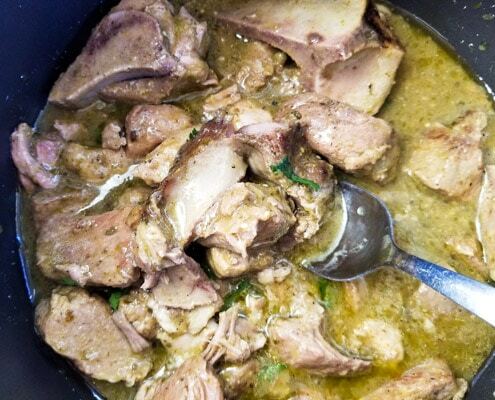 Or make chile verde tacos, tostadas or use for filling burritos. 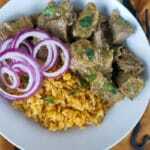 I served my ribs with yellow rice with corn and had a very comforting delicious meal…. I also think I have to give these crockpot bbq coca cola ribs by The Frugal Girls a try on my next slow cooker ribs meal…yum! These Incredible Slow Cooker Ribs are just that, incredible! Serve with white or yellow rice and have the perfect meal and comfort food. Or tuck ribs in corn tortillas, topped on tostadas or burrito wraps and have the perfect appetizer, lunch or meal. These slow cooker ribs promise to not disappoint! 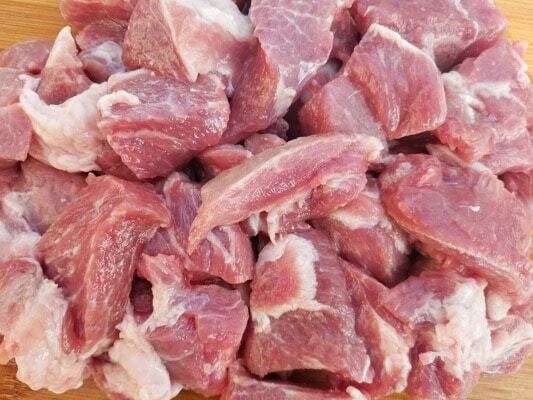 Cut up pork into two-inch cubes and season with salt and pepper. In a skillet over medium heat, add two tablespoons of oil and sear pork. Brown meat for a few minutes. 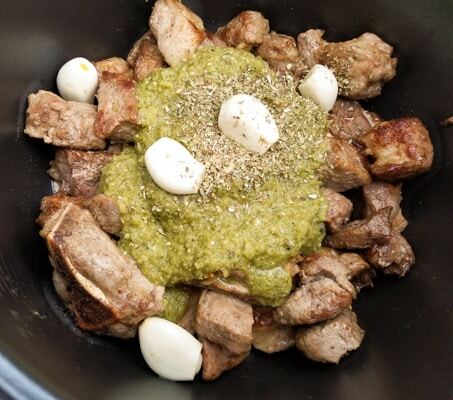 Add seared pork with salsa verde, chicken broth, crushed garlic, cumin, oregano, salt. Cook on high for 4 hours in slow cooker or 2 hours in instant cooker. Ten minutes before slow cooker ribs are done add chopped cilantro and stir pork ribs. Serve with white or yellow rice, tacos, tostadas or burrito filling. Enjoy! I hope you enjoy these Incredible Slow Cooker Ribs as much as I do..